Fully-hardy rhizomatous bearded iris with erect, narrow leaves and flower stems with 1-2 scented yellow and orange flowers in spring. To 25cm. The variety arenaria is even smaller than the type and has been used in hybridising dwarf bearded irises. [RHSE, Lynch]. Arenaria is ‘a very attractive little iris for the rock garden.’ [Grey]. Introduced to Britain in 1802. [PD]. 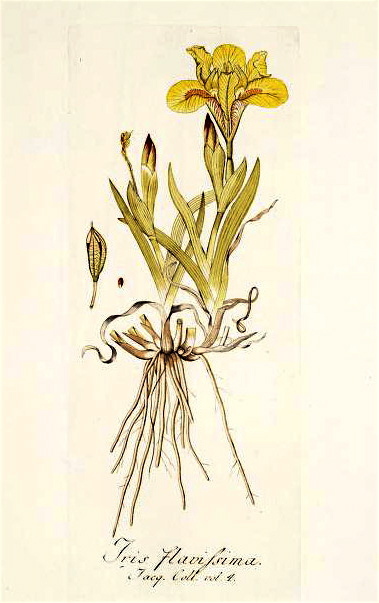 ‘A very newly introduced species; drawn in April last at the nursery of Messrs. Colvill in the King's Road; but had, as we are informed, made its appearance the year before last in the Physic Garden at Chelsea. Native of Hungary, where it is constantly found in dry sandy places. Differs from pumila by being smaller in all the parts, and in having a primary flower, the fruit of which miscarries, while that of the secondary flower comes to perfection; in regard to this character indeed, as far as we have seen, it differs from the whole genus. Flavissima, the nearest akin, is found constantly to affect springy moist places, flowers later in the year, and has a scape higher than the leaves. Lutescens, also very close to our plant, is much larger, with a proportionately longer scape. The four are very like, but still evidently distinct in port and economy, besides the above technical marks. Arenaria, we believe, will prove quite hardy; though the present sample had been sheltered in the winter.’ [BR f.549/1821]. Jacq. IPR pl.220/1781-1793. Listed in all published catalogues [B.229/1843]. Iris arenaria Waldst. & Kit.